28th Street: The flower district. I have worked in the proximity of 6th Avenue off and on for years, in hole-in-the-wall Russian-type shops, defunct art schools, college textbook sweatshops, gardening magazine publishers, you name it. I’ve seen 6th, between 23rd and 29th Streets, convert from phonograph needle wholesalers, mom and pop delis, and junk sales to a phalanx of high and higher-rise apartment buildings. Despite the Trumpization and high-rising of midtown Sixth, there are still some fiefdoms, industries that carry on, scrounging the ground around the new behemoths like the moles and shrews at the feet of the dinosaurs in the Cretaceous. Of course the difference is that the dino-defying insectivores lived on, while Tyrannosaurus died off. In the case of the flower district, the better bet this time is on Godzilla. 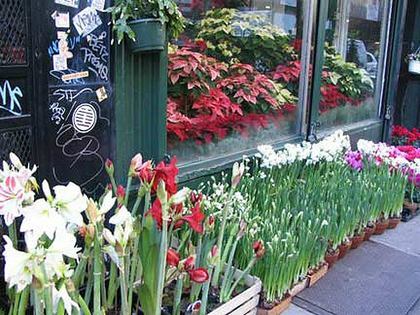 The Flower District had its beginnings as far back as the 1870s, when flower dealers congregated near the East 34th Street Ferry. In those days the Long Island Rail Road had its western terminus in Long Island City and many goods, including those from the flower farms of Long Island, were shipped across the East River. 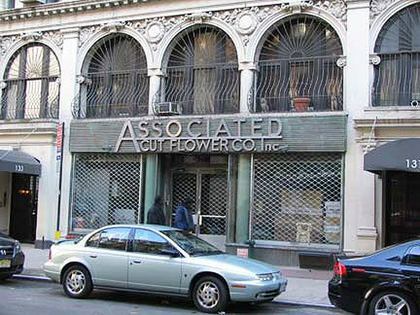 In the 1890s, though, the flower wholesalers moved here, in an area concentrated on 6th Avenue between West 26th and West 29th, to serve the theater and entertainment area, which was here at the time, as well as nearby Ladies’ Mile (between 14th and 23rd) 5th Avenue hotels…and the brothels of the Tenderloin District, of which 6th and 28th was the epicenter. You may well imagine your webmaster’s wonderment in the spring of a year almost comically remote when I staggered uptown from a publishing job at 5th Avenue and 20th Street and suddenly found 28th Street and 6th Avenue. During that time, there were more tons of flowers changing hands in these two spare blocks than anywhere else but Amsterdam, Holland. I’m not one to keep plants around the house, but I did spring for a bouquet of flowers for a girlfriend at Bill’s during the last decade. (Didn’t work, ultimately). As I recall I asked for all white. Rumors have persisted for years that the flower dealers would be moving, to the Meatpacking District, to Long Island City, to Hunt’s Point, following the Fish Market. Yet they continue to hold forth on 28th and 6th. A March 2006 report had eviction notices going out to the 28th Street merchants, but the holiday season that year seemed as normal as ever. 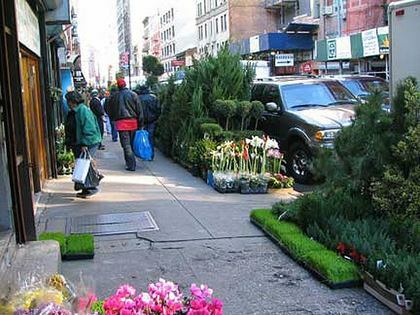 But the flower dealers say that the rezoning of the area to residential, as well as the terrorist attack of 2001 before that, has seriously and perhaps fatally dealt a blow. Much of West 28th’s architecture is anachronous, here a Machine-Age front with wrought metal lettering, two-story sheds, and an impressive brownstone front that may have been a theater or Masonic hall. 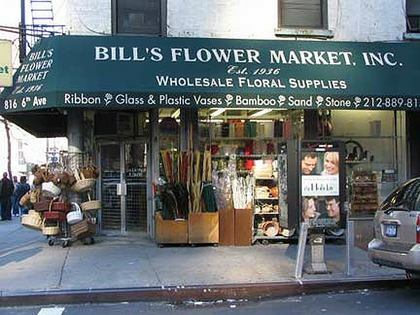 Yet, though stories have appeared for years advising of the Flower District’s imminent demise, it is hanging in there. Stroll the block if only for an olfactory break from the usual smells of the city.